It’s time for our now annual trip to the Kingdom. 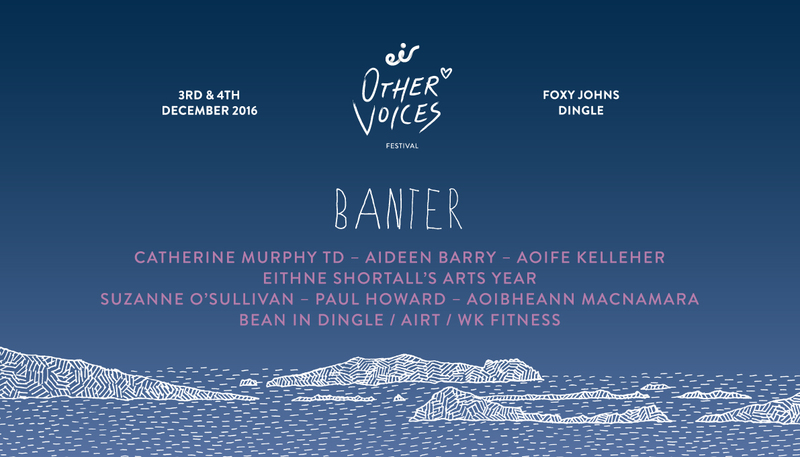 On Saturday and Sunday December 3 and 4, Banter joins Other Voices and takes up residence by the fire in the back of Foxy John’s in downtown Dingle where we’ll be joined by a fine cast of talkers, makers, do-ers and players for some conversations and music. We’ll be open for business both days from 2pm to 6pm and admission is free. Please note that capacity is limited so get there when doors open at 1.30pm if you want a chair or standing room. Aoibheann McNamara: an odyssey into slow food and slow fashion with the Donegal-born firebrand behind Galway restaurant Ard Bia and The Tweed Project. There will be also be music at Banter over the weekend from some fantastic acts turning up namely Jealous of the Birds, Jack O’Rourke, Ailbhe Reddyand, as become the tradition at Banter in Dingle, some trad maestros in the shape of Cormac Begley and Caoimhín Ó Raghallaigh. We will also have some very special suprise guests so don’t say you weren’t warned.